“Our technical civilization has just reached its greatest level of savagery. We will have to choose, in the more or less near future, between collective suicide and the intelligent use of our scientific conquests. Canada provided the uranium for those bombs; the native people who worked at the uranium deposit died and continue to die from radiation-caused cancers to this date. Canada provided most of the uranium for the bombs that were dropped on Hiroshima and Nagasaki in 1945 with devastating effects on the Dene people of Great Bear Lake. In the 1940s they started mining it using local people for labour. At the same time the Dene gave them caribou, moose and fish. “They were strangers living among us on our land so we took care of them.” In return, the locals helped extract and transport the deadly ore with no knowledge of its dangers. The southern miners left the people with toxic waste dumps in their community and radiation ticking in their bodies. Kazakhstan, Australia and Canada are the largest producer &exporters of uranium in the world. USA, Russia, China, Britain, Israel, France, India, Pakistan (and maybe others, including North Korea) have more than 17,000 nuclear bombs,. They are moving around the globe everyday on land, in the seas & the air. Together USA and Russia have approximately 14,000 nuclear weapons; the rest each have a few hundred or less. The bombs dropped on Japan were approximately 20 kilotons each; present day nuclear weapons are in the range of twenty-fifty megatons or 20,000 – 50,000 more powerful than toes dropped in 1945. The detonation of one hundred of these modern bombs would probably destroy all life on earth. Canada continues to be complicit in nuclear development by selling uranium and technology for nuclear energy (which also contaminates the world with harmful radiation) and for bombs. Canada provides highly radioactive so called ‘depleted uranium’, to 22 nations for weapons – bomb casings, guns, tanks and other steel-hardening military uses. Depleted uranium weapons were tested in Panama & used in Iraq, Afghanistan and former Yugoslavia. The Canada Pension Plan, mandatory for all working Canadians, invests our contributions in the 5 largest arm makers in the world which make nuclear as well as non-nuclear weapons that are sold to and used in many countries again civilian populations. Other pension plans worldwide also invest in nuclear and non-nuclear weapons manufacturing. Few countries have the stringent ethical conditions that Norway’s pension fund has. Our precious resources and energy should be directed to the creation of a peaceful, just and healthy world. Nuclear nations & a handful of men can destroy all life on earth & that unspoken threat is behind wars waged by nuclear powers today. Meanwhile the very production, storage and transport of nuclear weapons are in themselves major threats to our physical environment. 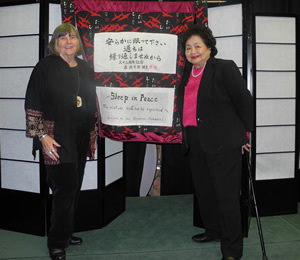 Setsuko Thurlow, buried in the rubble of her school in Hiroshima at the age of thirteen, but miraculously survived, is one of four Atom Bomb survivors in Canada. She says that climate change from most sources is slow & we can reverse it; climate change caused by nuclear explosion is instantaneous and irreversible. Theresa Wolfwood is a peace and social justice activist, poet and artist in Victoria, BC, Canada. 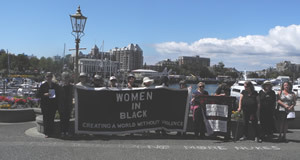 She is the director of the Barnard-Boecker Centre Foundation and co-ordinator of Victoria Women in Black. Her latest collection of poetry “Love and Resistance” is published by Smallberry Press, UK.